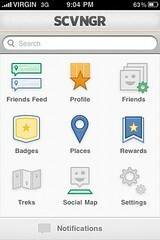 SCVNGR (think scavenger) is a social check in game all about going places. Available on iPhone and Android mobile clients and there’s also developer tools available for those who want to build on the platform. See scvngr.com. USers can enjoy a fun, social gaming experience, share details via facebook and Twitter, snap and include photos, go on a scavenger hunt, create a game, and much more. SCVNGR | How To Play from SCVNGR on Vimeo. ESRI Mapping via facebook and the Make A Map video? You betcha!